Today am going to review one more of my winter favorites from Biotique. I have already tried this product last winters and loved it. This winters I was again thinking of buying it, when Biotique sent me that themselves. 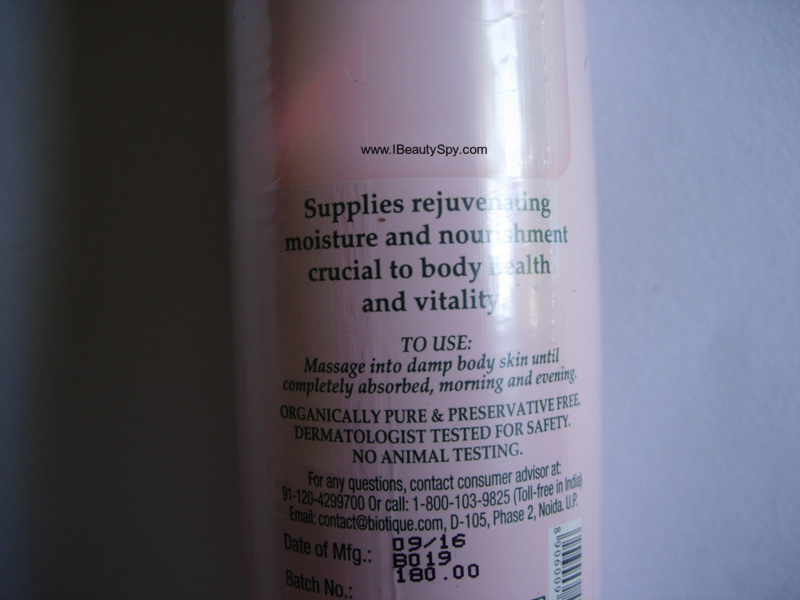 I have already reviewed Biotique Bio Honey Cream Rejuvenating Body Wash. Using it along with this body lotion, makes it the perfect combo for winters. 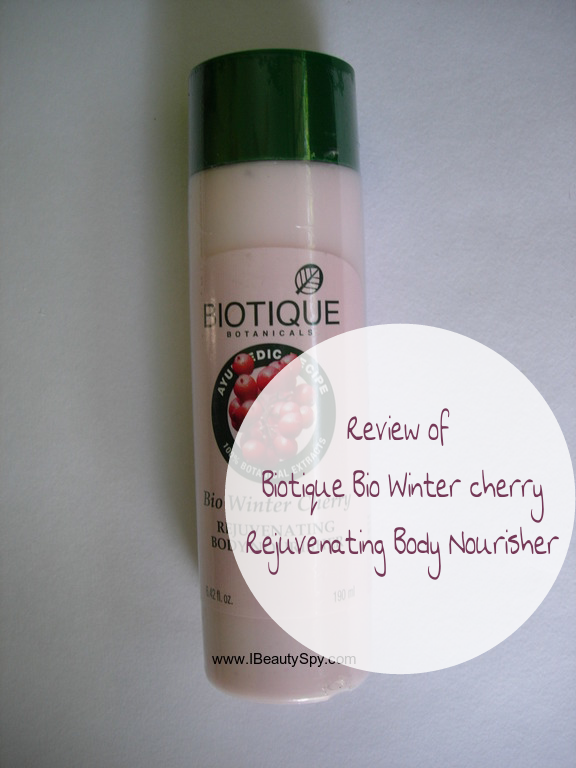 Read on to know my experience with Biotique Bio Winter Cherry Rejuvenating Body Nourisher. Surajmukhi tail (Helianthus annuus oil), Kusumbhi tail (Carthamus tinctorious oil), Sarsoan tail (Brassica nigra oil), Badam tail (Prunus amygdalus oil), Jatamansi (Nardostachys jatamansi), Ashwagandha (Withania somnifera), Lotion base Q.S. First of all, I have really dry skin throughout the year. And during winters it becomes more dry and scaly causing itchiness. I have tried lot of body lotions and expensive body butters. Nivea Nourishing Body Milk for dry skin was the only one that worked for me. I have allergy to cocoa, so the cocoa based body lotions for dry skin don’t work for me. Coming to body butters, they work well for me, but they are expensive and I can’t keep buying them every time. Overall, I needed an affordable body lotion, which is natural and organic and at the same nourishes my extra dry skin well. And Biotique Bio Winter Cherry Rejuvenating Body Nourisher is a winner in that. 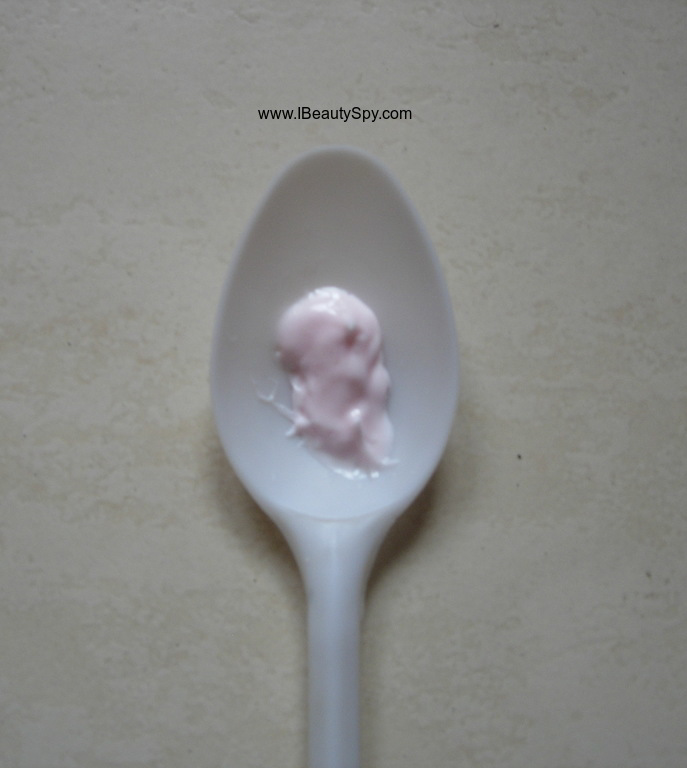 The lotion is light pinkish in color and has a thick, creamy consistency. Though its thick, it spreads and blends easily. The fragrance is ayurvedic and relaxing to the senses. It fades off after a while. On applying, I can immediately feel a warm, soothing effect which feels very relaxing to my feet in winters. It gives you a good feeling that you are treating your body to ayurvedic goodness rather than some harsh chemicals. The lotion moisturizes and nourishes dry skin well. With regular use, my skin looks revitalised, healthy, smooth, soft and supple. If you have very dry skin like me, you can observe effective results from 3 days itself. Within 3 days, my dry, parched and scaly skin was nourished and soft. The moisturizing effect lasts for an entire day, so you don’t need to reapply. You can use it once in morning and once in night and that will be enough. Since it doesn’t have SPF, you can layer it up with sunscreen in the morning. * Thick, creamy consistency which spreads and blends easily. * Gives a warm, soothing effect on applying. * Moisturizes and nourishes dry skin. * Moisturizing effect lasts for entire day. * Revitalises dry skin and makes it healthy, smooth, soft and supple. * Visible results can be seen within 3 days of using it. * Natural, organic and cruelty free. * Contains goodness of many ayurvedic ingredients. Only key ingredients are mentioned in the packaging. I wish they mention complete ingredients list. Yes, definitely. This is already my second bottle. Yes, its very affordable as well as effective. Availability: You can buy online from here or here at a discounted price. 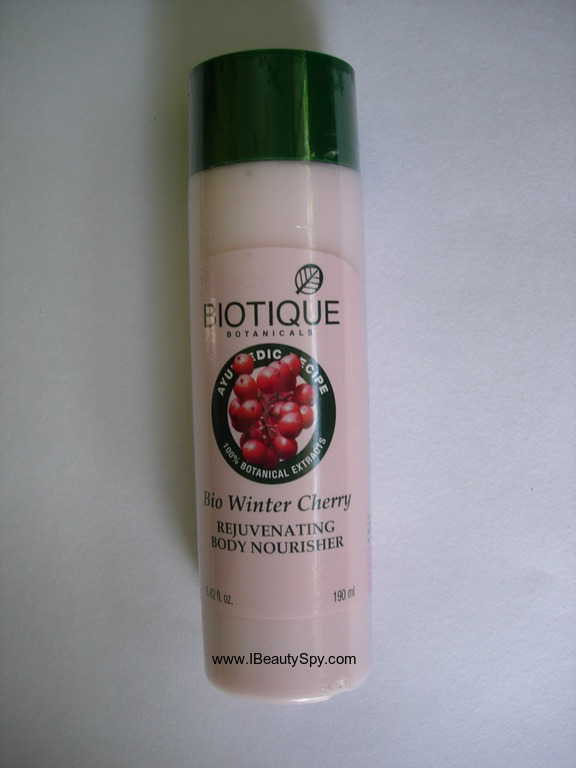 Now you know why Biotique Bio Winter Cherry Rejuvenating Body Nourisher is among my winter favorites. 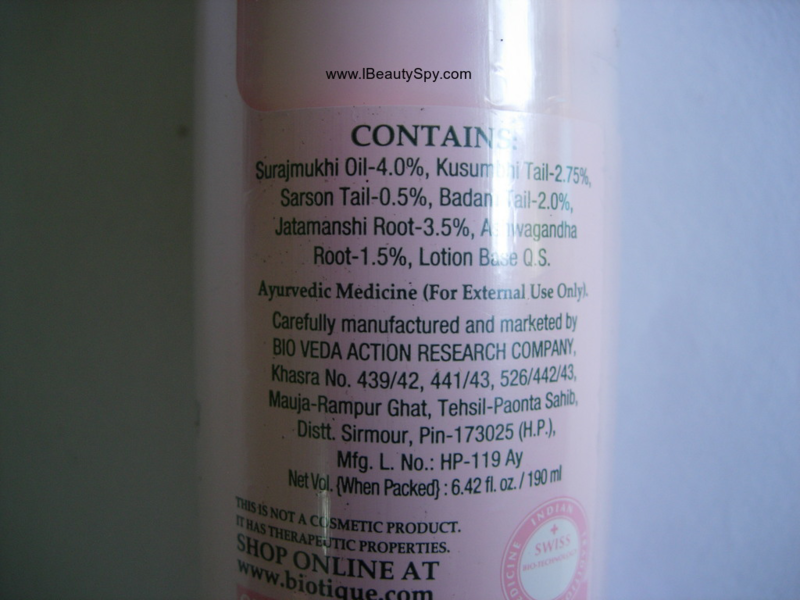 It is natural, ayurvedic and very effective and nourishing than other drugstore brands. Plus its super affordable as well. I would definitely recommend everyone to give this a try. Pair it up with Biotique Bio Honey Cream Rejuvenating Body Wash and you are all set and ready to face the dry winters! Lovely 🙂 I love Biotique products too! Sounds like a great moisturizer ..will give it a try for sure. Wow nice review. Currently in love wit biotique products. Nice review. Seems good body nourisher. Thanks for the review. Lovely review 🙂 Since it is affordable I would definitely give this a try..! There is a Biotique counter in my nearby beauty store. I have seen this one there. Would try it when my current body lotion gets over.